« Who’s the Better Boss? My sister-in-law eats an apple every day. She’s religious about it. Ive never really understood why she is so steadfast about it, but I’ve recently learned that it doesn’t matter. I should follow suit regardless because she’s onto something. I was a bit shocked last week when I read this article about all of the health benefits of apples. Of course I’ma accustomed to hearing the praises of blueberries and grapefruit sung. But apples? I had no idea they were much more than convenient additions to a brown bag lunch. Nevertheless, they are apparently all of the following: beneficial for weight loss, beneficial for digestive health, antioxidants, and agents in preventing oral, breast, colon, and kidney cancers. Bits of information like this inspire me in some strange way. I think it’s because of their simplicity. In a world where we are constantly inundated with copious – and often conflicting – information about our health, it is such a relief to learn that for once that the advice is easy. We give up carbs and gluten but we aren’t sure why. * We read about the evils of sugar and then try to figure out whether or not sugar substitutes count. We hear from one source that we should take a multi-vitamin and from another that we shouldn’t. It becomes overwhelming quickly. But this? This I can get behind. So instead of waxing philosophical about the beauty of simple advice, I’m going to let the advice stand alone. 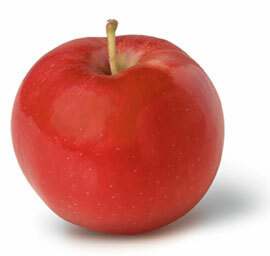 Eat an apple today. In fact, eat two. And if you need more convincing, go read the article. Then go eat your apple. Your body will thank you. *I really don’t understand the current gluten free craze. For anyone who doesn’t have celiac disease, what’s the problem with gluten? This entry was posted on Tuesday, April 24th, 2012 at 5:00 am	and is filed under Health. You can follow any responses to this entry through the RSS 2.0 feed. Both comments and pings are currently closed. I’m so glad you wrote about this, Gale. I missed this news item (or items), though we’ve always been fans of the apple around here (Braeburn, Granny Smith, Gala… you name it). An apple for the teacher? Sounds like an apple for the student will also be equally welcome. And I couldn’t agree more – it’s cheering when sometimes these info-bites offer simple solutions. I’m not sure the “science” (true quotes are needed on this because I suspect none exists) on the “gluten free” fad. However, being the mom of one celiac child, I am thrilled. My weekends are no longer filled with baking breads and treats, making graham crackers (okay still make those because mine are awesome), etc….. Hugely beneficial. I hope the fad doesn’t go away! And I think I’ll start eating an apple a day – sounds like it just might keep the doctor away. Cathy – Thanks for this perspective. I hadnt’ thought about how this fad (you’re right, it is totally a fad) would be so beneficial to those people with actual gluten problems. For your sake, that that of others with celiac family members, I hope the fad continues too. And worst case scenario, even if the fad dies off, I’m sure there will continue to be a wide variety of gluten-free product and ingredients available in stores.